Sometimes it’s the simple things that are the most fun. We love coming up with activities which involve kids and plants, and they don’t always have to be complicated. 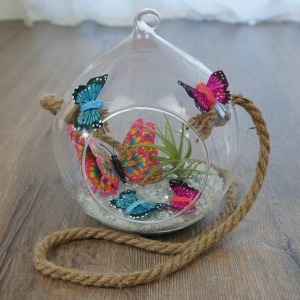 Take this simple butterfly terrarium as an example. An inexpensive hanging glass pot made the perfect home for our pretty butterfly terrarium which can now be found hanging in my daughter’s light-filled bedroom. When you’re planning out your craft ideas, it’s important to make them time relevant because it can easily lose momentum and interest. The girls wanted an activity to work on before we had lunch and this was the perfect solution. Air plants are a bit like succulents. Easy for kids to handle, simple to look after and they just look amazing! A great little project for the school hols. Air plants grow without soil. They are one of the few plants you’ll find hard to kill. For this reason, they make the perfect gift, especially for that black-thumbed friend. There are many different varieties of air plants, and they come in lots of different shapes and colours. They can attach themselves to rocks or trees by using their root system, or simply remain suspended and placed in an open terrarium like this, or within a display. The key to keeping an air plant alive is…wait for it…air circulation. I know right!. Keep the air flowing and your air plant will keep growing. 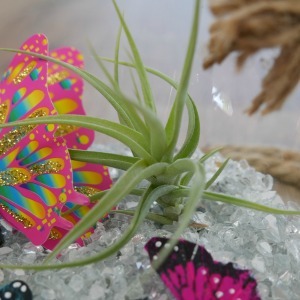 To keep your air plant fresh, give them a spray of water or remove them and place them in some water for a few hours. Then just place them back in position.